Going into the 2013 model year, the Dodge name has nowdropped from Chrysler’s pickups. Where they used to be referred to as Dodge Ram models, the Dodge name has been reserved for the car line, while the truck line has been renamed Ram. Being the “other” American pickup truck offering is a status the Dodge Ram pickups have either enjoyed or endured (depending upon your perspective) for quite some time. Perennially bested in sales by the Ford F-150 and the Chevrolet Silverado, to compete, the Dodge pickup trucks went higher profile in 1994. Back then; in the midst of the design revolution at Chrysler, the pickup’s product management team approved the now ubiquitous Dodge “Big Rig” look — mimicking Peterbilt’s long nose styling language.With the introduction of that model, the Dodge, nee Ram, offering became a more prominent aspect of the American pickup truck market. Available in Regular-, Quad- and Crew-cab configurations, with either four-wheel drive or two-wheel drive and both long and short truck boxes, Ram 1500 trim levels range from the basic Tradesman package up through SLT, Sport, Laramie, Laramie Longhorn and the ultra luxurious Laramie Limited package. On the features/technology/ergonomics front, all of the Ram 1500's secondary controls have been grouped by function, making them much easier to locate. While this sounds like such a logical thing, many manufacturers overlook it. Chrysler’s Uconnect infotainment system has also been applied to the new Ram truck and uses an 8.4-inch touchscreen interface—in addition to the redundant controls for each incorporated system. Additionally, TFT (thin-film transistor) technology has been incorporated into the instrument cluster—enabling instant reconfigurability of the instrumentation and the information provided—depending upon the operating mode selected. A new electrical architecture was developed for the Ram to enable the new electronic feature-set. High and low-speed data networks are employed for both comfort and convenience features, as well as to improve the truck’s performance. The Ram is also capable of functioning as a Wi-Fi hot spot. Available Smartphone applications include remote lock and unlocking of the truck. Speaking of locking the truck, the new Ram has a central locking system like that applied to better luxury cars. Locking the Ram’s doors also locks the storage bins in the walls of the pickup box, in addition to the fuel-filler and the tailgate. Pickup trucks remain the one segment in which American automakers still enjoy near total dominance over the marketplace. 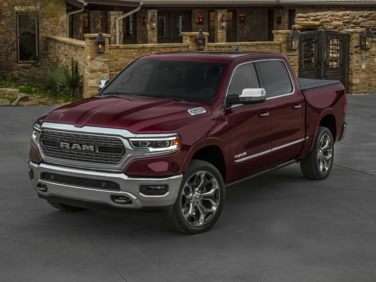 With this new Ram 1500 being as good as it is, we can guarantee the product teams and engineering staffs at Ford and Chevy are burning the midnight oil in an effort to maintain their traditional supremacy in this segment.